This subform is dedicated to game information, updates, and future discussions relating to Black Desert Online. 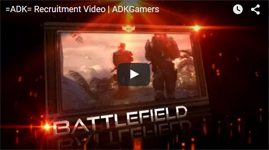 Come be a part of the Heroes Of The Storm Gaming Community within =ADK=! Talk about new champions, your favorite builds, you name it! PLAYERUNKNOWN'S BATTLEGROUND is the latest Battle Royale game from the creator of the wonderful mode for the ARMA series. Come join and participate in the Player Unknown Battleground Community here at =ADK=. Possible TF2 Comeback. . . This subforum is for general discussion and meetups involving World of Warships. Valve Returns To Releasing Games! Amnesia Games - Free for a limited time! New Games of 2018 - What are you look forward to? Keep talking and nobody explodes!